For 112 years a modest building in Haines Road, near the entrance to Tea Tree Gully, served as the headquarters of the district council. Built in 1855, the first council chambers incorporated two cells, as the building was intended for occa­sional use as a police court. Efforts to form a local district council were made shortly after the Act to appoint District Councils in South Australia was passed in 1852. The initial meeting was held in the school­room at Houghton, where “it was the opinion of many that the interests of those living in the hills and those on the plains do not assimilate”. Subsequent meetings were held at Montague (Dry Creek), at the Osmond Gilles Inn on the North East Road, and at the Bremen Hotel, Hope Valley. As a result of these efforts, five councillors Robert Milne of Modbury, John Gollop of Houghton, Joseph Ind of Para­dise, George McEwin of Glen Ewin and Henry Klopper of Hope Valley were elected first councillors. The District Council of Highercombe was gazetted on 14 July 1853 and held its first meeting in the Bremen Hotel. Until council chambers could be built, the council met alternately at the Bremen Hotel, Hope Valley, and the Travel­lers’ Rest, Houghton. With the opening of the Tea Tree Gully Inn and the Highercombe Hotel in 1854, some meetings were transferred to these hotels. 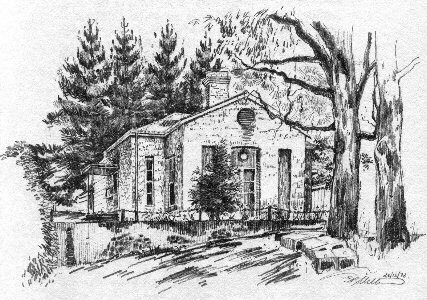 With the division of the district into two council areas in 1858, the new Tea Tree Gully Council retained use of the council chambers, while the Highercombe Council, until the Hope Valley Institute was built in 1921, met each month in the parlours of the Highbury Hotel, the Bremen, or the Travellers’ Rest, Houghton. With the compulsory amalgamation of the two councils in 1935 the council chambers became the headquarters for the new District Council of Tea Tree Gully. In 1855 against the wishes of Councillors from Houghton and Hope Valley, the Council Chambers were built in Steventon, close to the entrance to Tea Tree Gully. It seems certain that the Council Chamber was the first to be erected by any council in the colony and was used as such until 1967. Two cells were incorporated into the Council Chambers when it was first built, as it was intended that the building was to be used as a courthouse. The cost of the building was 400 pounds, one third of the entire year’s fund. When protested against at a public meeting held at the Bremen Hotel, the siting of the new building at Steventon (Tea Tree Gully) was questioned, but the new chambers were in fact centrally placed. A further objection was that an extra threepence had been added to the rates! In answering these objections it was pointed out that for 400 pounds, the District had gained a Council House, a Courthouse and a public meeting place. In April of 1856 Thomas Crews resigned as district clerk and Thomas Edward Cooke at 29yrs, was appointed to the position. Before the Council Chamber had been completed, Cooke had applied for use of the cottage attached to the council office. On the understanding that Cooke would ‘keep the rooms clean and take charge of documents and letters addressed to the Council’, use was granted at a weekly rent of 2/-. Cooke remained District Clerk and village storekeeper until his death in 1866. The Highercombe Council received, as all councils, its share of complaints, one being that all the rates were being spent on the northern side of the district, particularly in the immediate vicinity of Councillors homes! The balance sheet for 1856 reveals some interesting expenditure. Six cedar-stained chairs were purchased for the Council Chambers. (How did the Councillors sit for the previous three years)? A five-stalled stable for Councillors’ horses was erected and the Council Chamber was plastered. The first Council equipment was also purchased in 1856 – ‘2 wooden wheelbarrows, 2 picks, 2 shovels and 1 crow bar.